The Walton Centre NHS Foundation Trust in Liverpool is renowned for its specialist neurological care, taking patients from across the UK who need the medical staff’s expertise. However, coming from far and wide, the experience can be even more difficult for patients who are long distances from loved ones. Within the hospital is the Horsley ITU Critical Care Unit, dedicated to those patients who need continuous supervision and care following life-threatening injuries, serious surgery or acute illnesses. Consultant neuro anaesthetist Dr Will Loh once tried to help a patient use his own iPad to contact family members, but due to the patient's medical condition, found they were unable to hold the device. This inspired him to approach the IT department to come up with a workable and more permanent solution to benefit future patients coming through the ITU. Andrew Evison became the technical project lead. Together, they decided video calling functionality would be beneficial, both for patients to spend time with relatives and for consultants to run “virtual clinics” to get updates on a patient's condition. They also agreed to source software for patients who were unable to speak to make sure they could address questions to their medical team and, in turn, the doctors could find out how patients felt during their stay. The project relied on a suitable Wi-Fi network to provide the connectivity required for such solutions to work. 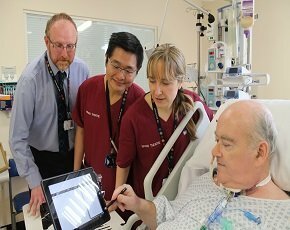 “We could have used the internal Wi-Fi, but because we go through the NHS network, we felt there could be issues with spikes in use, in terms of bandwidth or potential security issues,” says Evison. However, the Trust already had a public Wi-Fi network and believed this might be the answer. “We have got quite high bandwidth through that network, at around 10-12Mbps, so we had a quick conversation with our Wi-Fi supplier – Wi-Fi Spark,” he says. The supplier suggested the devices for use on the free Wi-Fi could be segregated and given a specific amount of bandwidth. Evison decided to go with Apple iPads for the project, as the tablets were already being used elsewhere in the hospital, so support was already in place. “The Trust has about 70 to 80 iPads, used in various different ways, such as executives using an iPad with secure email software or a project called ePatient where we are pushing out our risk assessments and documents that would traditionally be paper based into electronic form and onto the iPad,” says Evison. Using the MAC addresses of the tablets, Wi-Fi Spark siphoned off the devices from the rest of the network, ensuring they had the necessary bandwidth for the solutions. Apple’s built-in video calling tool, FaceTime, was adopted as a method for patients to contact relatives who also have Apple products, but Skype was also installed to ensure wider compatibility, be it for personal conversations or consultations with doctors. For those patients who are unable to speak due to their condition, the team decided to install AssistiveWare’s Proloquo2Go. The software allows patients to type what they want to say, with predictive text to make it easier, and then converts it into audio to relay the message. “The only issue we initially came across was how we would give it to the patient, both in terms of being hands-free, mobile and security conscious – locking it to a stand in some way,” says Evison. The Trust had already worked with a company called RDP Health to tackle some of these issues for its computers on wheels (COWs) project, which enabled staff to move a laptop around the hospital and input data when next to the patient, rather than back in their offices on desktops. The same basic stand was adopted, with the addition of an Ergotron flexible arm and Kensington Secureback case, which locks the iPad to the bed, keeping it within reach of the patient, safe from harm and easy to clean. Evison and his team completed the whole project in just four months and within a budget of £10,000, delivering the solution to five rooms within the ITU. Once the team saw it in action, the benefits of their hard work became clear. “We trialled it with one patient who was so excited when he got it,” says Evison. “When he spoke to his daughter, who lives in the Isle of Man, he was completely made up and his daughter was in tears. It was quite an emotional moment. Now, Evison and his team are looking to the future, and the first thing they are examining is whether they can try this out with other tablets. “We are looking at Windows tablets, but it is very early days. We also have to think around things like security, using them on a ward and making them medically clean all the time,” says Evison. But the success of the initial roll-out has led the team to think how the systems could be used elsewhere in the hospital. “I could see other uses for this, because we are not just using it for patients. There is the opportunity to use it for more virtual clinics, such as when a patient’s relatives can’t get to an appointment or it is a cost to people travelling. If they can get access to a computer, we can create a clinic where they can speak to each other. There is definitely expansion potential,” says Evison. “In IT, there are lots of buzzwords and phrases about being for the benefit of people, but you don’t often see that. With these solutions it is actually nice to see it at the coalface,” he concludes.